During my stay I took one day to try one of the 13 included excursions. As in the spa, guests simply pay a 20% service charge. I am impressed with the list of offerings that includes everything from swimming with dolphins to a guided tour of Chichen Itza, one of the Seven Wonders of the World. Adventurists will love the Selvatica Extreme Canopy trip or Xtreme snorkeling. I choose one of the signature experiences, a trip to an authentic Mayan Village and the Tankah Cenotes. Our guide Cesar takes us to three cenotes, natural swimming holes formed by the collapse of porous limestone bedrock. Cenotes only exist on the Yucatan Peninsula. At the first hole, Cesar encourages the brave and the bold to jump off the cliff into the cenote. Being a wuss when it comes to heights, I walk down and then jump in. The next two cenotes we visit also offer the opportunity to zip line and jump in. After the swimming my group has lunch in the Mayan village before heading back to UNICO 20˚87˚. Golfers are taken to the nearby Hard Rock Resort and its 18-hole Robert von Hagge course to hit the links, again paying just the 20% service charge. UNICO 20˚87˚ is a member of The Leading Hotels of the World and my 1,270 sq. 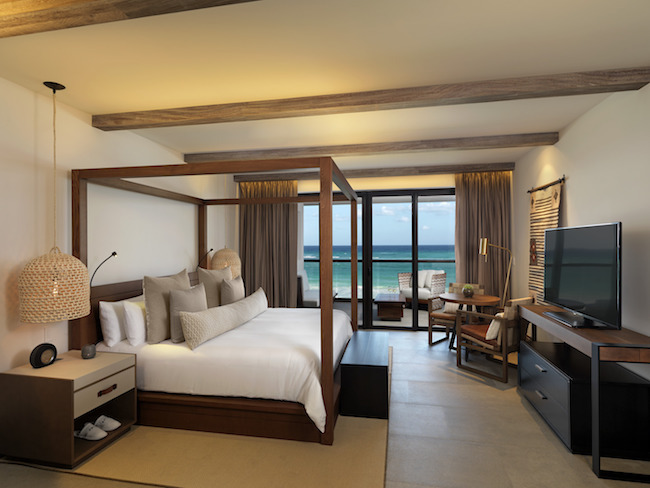 ft. one-bedroom Estancia suite was proof of why the property is included in the exclusive hotel group. The space is all about relaxed, unpretentious luxury. The color palette is neutral grey, beige and white with highly textured and interesting interior furnishings. 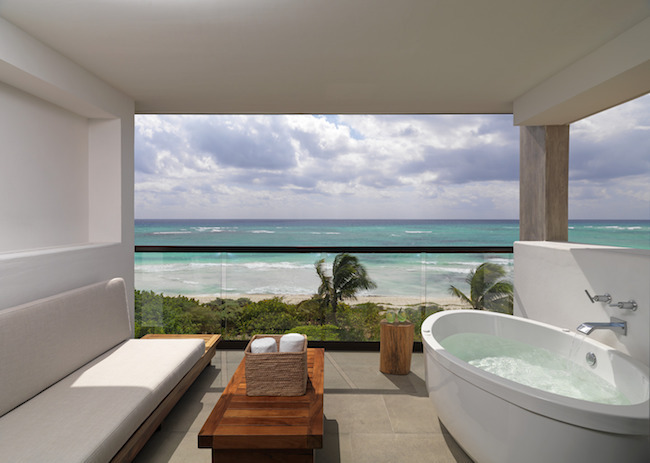 I fell in love with my huge ocean-view balcony that had a hydro-tub for al fresco bathing. Be warned though, the space isn’t entirely private, so undress knowing you might be giving an unsuspected peep show! 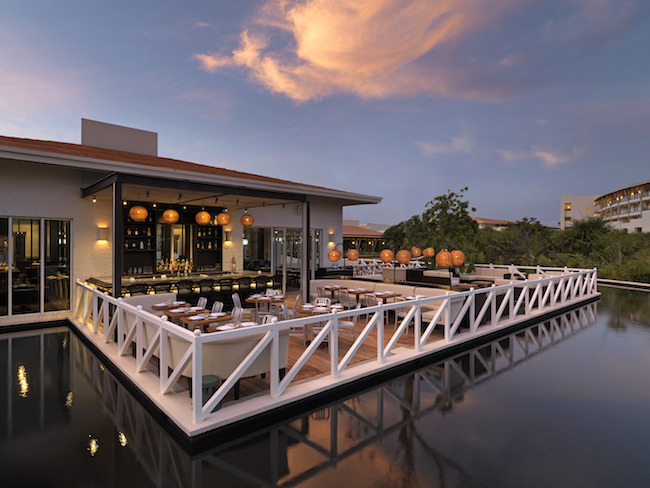 Guests at the new resort also enjoy five restaurants, including one from celebrity chef Christian Bravo. One of my favorite elements of UNICO 20˚87˚ was the strong entertainment offered at different venues on property including the Palmera Lounge, a Cuban-inspired bar that featured the sultry voice of up-and-coming singer Yoli Mayor, a 21-year-old powerhouse called the Cuban Adele. 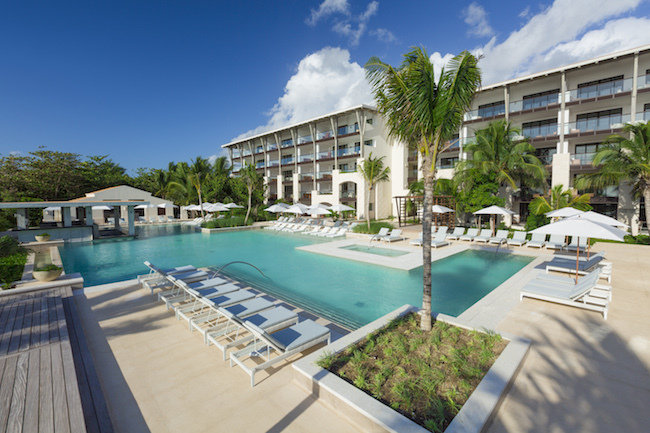 Life at the hotel revolves around three pools that offer a much-needed respite from the intense heat and humidity. The beach and a dip in the ocean are just steps away. 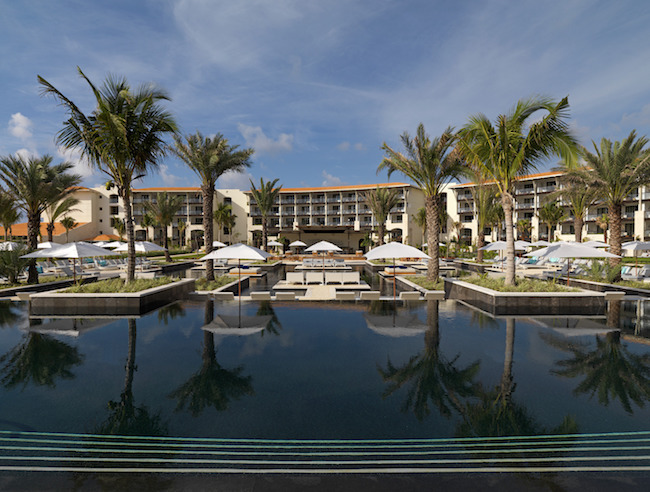 From relaxing at the resort to exploring the surrounding area,UNICO 20˚87˚ is an ideal base for couples or girlfriends looking for some value-added with their luxury getaway.